Can Motorola bring its modular phones' best features to the $400 price point? The Moto Z Play Droid gives it a good shot. For the past two weeks, I've been carrying around two phones — one in each pant pocket. Both are alike in many ways, but one costs around $300 more than the other. This is the truth of the Android market in 2016: high-end, expensive smartphones are increasingly difficult to differentiate from their much-cheaper counterparts. Such a supposition is even more profound when you consider the two phones I am carrying with me: the Moto Z Droid, and the brand new Moto Z Play Droid, Motorola's newest entry into its modular lineup. Coming to Verizon on September 8 for just over $400, to the rest of the world (as just the Moto Z Play) at the end of September, can the Moto Z Play Droid stand on its own as a phone while successfully integrating into the growing lineup of Moto Mod accessories? Let's find out. At its core, the Moto Z Play Droid (hereby known as the Moto Z Play for brevity's sake) is a slightly thicker, slightly less powerful Moto Z — or a Moto Z Force without the ShatterShield screen. Either way, it looks remarkably similar but knocks some $250 from the price tag. For that, you get a 5.5-inch 1080p AMOLED display, down from QHD on the other two models; a slower (though higher-core) Snapdragon 625 processor, and 3GB of RAM, down from the Moto Z's Snapdragon 820 and 4GB of RAM; and a 16MP rear camera sensor that gains some resolution but loses the all-important optical image stabilization. You're also getting an ample 32GB of internal storage, plus an expansion slot, which is a pleasant surprise. I noticed very little difference in performance between the Play and the Moto Z — and that says more about the Play's excellent performance than it does about the Moto Z itself. Those are many words to say this: the Moto Z Play is clearly aimed at a different market, but as I said in my intro, the phone doesn't feel considerably slower than its namesakes. That's the upside: Qualcomm has redeemed itself from the cludgy, inconsistent performance of the Snapdragon 615 (and its 2016 sequel, the Snapdragon 617) by moving to a more efficient 14nm manufacturing process, which allows for much faster clock speeds per core without increasing heat output. In fact, the Snapdragon 625, even clocked 500MHz faster than the 615, is 35% more efficient. In day-to-day use (and I used the Play for about a week as my main phone on Verizon in New York City), I noticed very little difference between it and the Moto Z — and that says more about the Play's excellent performance than it does about the Moto Z itself. And while other devices, like the Asus ZenFone 3, have been announced with the same Snapdragon chip, I suspect the Moto Z Play represents its ideal form, though we'll have to see how it holds up over time. The phone aesthetically resembles the Moto Z series, forged from the same aluminum frame, and has approximately the same dimensions. At 6.99 millimeters, it's not thick — not even close — but after using the lithe 5.2mm Moto Z it feels chunky. It's ever-so-slightly taller and wider than the Force, but could pass for it with limited scrutiny. The back, though, is different: whereas the Z and Z Force have two pieces of glass at the top and bottom for the antennas buttressing rigid stainless steel, the Play saves some money (and invites some scratches) with an all-glass back, with metal reserved for the camera module and Moto Mods pins. There's a subtle concentric circle pattern at work behind the glass, which is visually pleasing, but I prefer the dual-tone look of the Z line overall. The Moto Z Play is the fourth phone after the Moto G4 Plus, Moto Z and Moto Z Force with Motorola's new square fingerprint sensor, and as useful as it is it's still not particular attractive. Thankfully, the company has moved the "Moto" logo from below the screen to above it, shifting the entire display down a centimeter and making it easier to use the phone with one hand. Moto Mods are still very much a part of the story here, since the Play features the same pins and magnets that made the Moto Z and Z Force so interesting. On the subject of the Moto Z line's overall aesthetic, I agree with Phil that the series is rather plain, but unlike most devices they can easily be augmented with magnetic Style Shells (one of which comes in the box) and a host of Moto Mods. Those Mods are still very much a part of the story here, since the Play features the same pins and magnets that made the Moto Z and Z Force so interesting. And with the Play's $400 price, all the benefits of the add-ons, from the JBL SoundBoost speaker to the Moto Insta-Share Projector, are now accessible to an entirely new subset of consumers. My favorite Mod, the Incipio/Tumi Power Pack, which adds a 2,220mAh battery and wireless charging to the Z series, is not necessary here: along with the more efficient processor and lower-resolution display, there's a 3,510mAh cell inside the phone that alleviates the anxiety I feel when using the Moto Z on its own. Seriously, this battery is amazing. And while the 1080p display doesn't get quite as bright as the QHD version on the Moto Z, it's almost indistinguishable in terms of color calibration and viewing angles. Of course, many other phones, like the $399 OnePlus 3 and Honor 8, offer also boast excellent 1080p displays (and the ZTE Axon 7 a pretty great QHD one) and better spec sheets — so what makes the Play worth considering over those devices? This is where we may disagree, but here's my thing: when it comes to phones, I don't want to overcomplicate things. I don't want to heavily customize or theme, and I don't need much but an Android experience that offers the bare essentials. That's why I've lauded Motorola's light touch to Android since the Moto X debuted in 2013, and admired its restraint since then. The Moto Z Play picks up right where its predecessors left off, and changes very little. While the phone lacks the infrared sensors of the more expensive models — the ones that magically turn on the screen with a wave — the Play still has Motorola's most potent advantage over other devices: Moto Display. To me, this is the glue that holds the whole experience together, the small detail that raises the Play, and other Motorola phones, above the commodified Android smartphone that it is. That this year Motorola didn't merely rest on its laurels but improved Moto Display in substantive ways — showing more detail per notification, and supporting rich music controls — makes the experience even better. Moto Display pulses with a new notification, but the Moto Z Play also uses its proximity sensor to detect when your hand is approaching, which isn't quite as impressive as the more expensive products, but it still works well. Elsewhere, the Play runs the same version of Android 6.0.1 as its Z counterparts, and unlike 2015's Moto X Play includes all the voice and gesture-based add-ons that flesh out the Moto software experience. Requisites like the double-twist to turn on the camera, and double-chop to enable the flashlight are here, but surprisingly so are the voice services, which are consolidated under the Moto Voice moniker. To me, Moto Display is the glue that holds the whole experience together, and raises the Play above the commodified Android smartphone that it is. For anyone who has used a Motorola phone over the past three years, the software experience is a known quantity. Whether you like it or not depends on your desire for customizability — outside of a few abstract wallpapers and the choice of standard or vibrant colors there isn't much to alter — and allegiance to the "stock Android for life" philosophy. Me? I like it because it's fast and fluid all the time, even with 3GB of RAM and a low-cost processor, and has truly useful add-ons that improve my life. Here's where things get interesting compared to the Moto Z: the Play has a 16MP sensor with slightly larger pixels, but loses the optical image stabilization and Deep Trench Isolation of the more expensive phone. It also has a slightly narrower f/2.0 lens compared to the Z's f/1.8, but uses a combination of both laser and phase-detection autofocus to find its subject in the dark. The sensor does struggle under low-light, more so than the already-handicapped Moto Z, and without the help of optical image stabilization it is forced to keep shutter speed as high as possible and ramp up light sensitivity (ISO). It appears that Motorola is capping the shutter speed at 1/15 and the ISO at 2000 to maintain consistent quality in well-lit areas. Unfortunately that means there is no hope for low-light situations, unless you want to use the flash. Still, it is no worse than most sensors in its price range, and appears to keep up with the likes of the OnePlus 3 in daylight (though a true camera test will be required to confirm those assertions). The Motorola camera software has also been improved over last year's models, and the Play has the same manual features as the other Z devices. 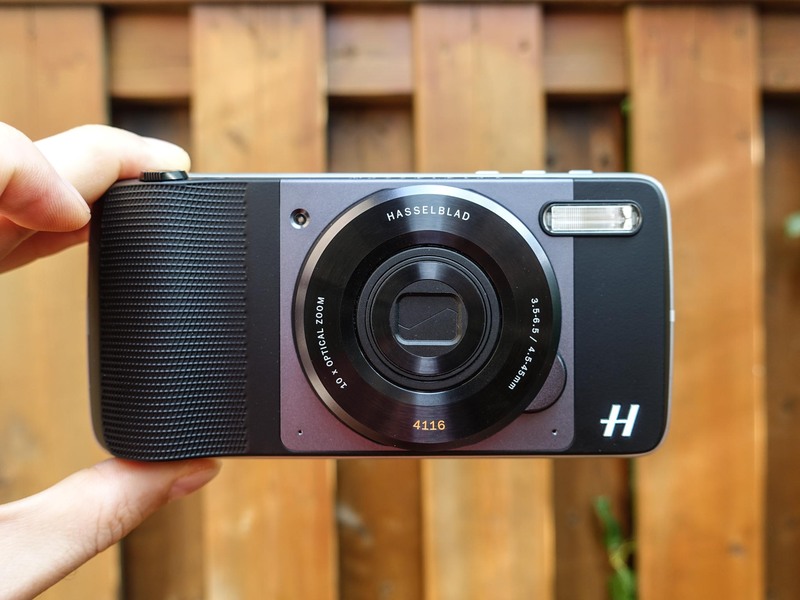 It also adapts to the presence of the Hasselblad True Zoom Moto Mod, adding a number of unique modes, along with the ability to shoot in black and white and in RAW. The spareness of the UI will continue to be a sore spot for some power users, but it's a lot better than on previous phones. And even more surprisingly, the phone supports 4K video capture at 30fps, a highlight of the Snapdragon 625's improved image signal processor and improved bandwidth. The Moto Z Play isn't the only big announcement from Motorola at IFA. The company is debuting its biggest collaboration ever, with legendary camera maker Hasselblad. The $249.99 Moto Mod offers a 12MP sensor and terrific 10x optical zoom, with photo quality that surpasses any smartphone on the market. None of them can be uninstalled, just disabled, and the Verizon-branded apps are of particularly low quality given the investment the carrier has made in the Android ecosystem. Still, they are avoidable, and apps like Message+ should quickly be replaced with a more friendly alternative. And being a Verizon phone, the phone is unlocked for other networks, though it won't be as usable as the international version outside of the U.S., since it only has a few LTE bands. Call quality on the Verizon network was excellent during the few calls I made to friends and family in the U.S. and Canada. I rarely dropped an LTE signal throughout New York City, and was not treated to any outages. Moto Z was designed to be the world's thinnest premium smartphone and the design didn't allow for a 3.5mm headphone jack. Moto Z and Moto Z Force share the same board design so the component placement of a 3.5mm jack was not possible on the Z Force either. Moto Z Play is a different design and allowed for the 3.5mm headphone jack. We'll have lots more with the Moto Z Play Droid and the international counterpart, the Moto Z Play, in the coming weeks. In the meantime, you can grab the phone at Motorola.com and Verizon starting September 8 for $408.